Transformation is the step in the genetic engineering process where a new gene (transgene) is delivered into the nucleus of a plant cell and inserts into a chromosome where it is passed on to progeny. Transformation means to genetically change a living thing. A genetically engineered plant has been transformed and is sometimes referred to as a transgenic plant. 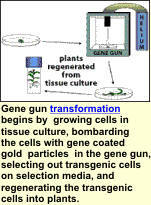 Transformation is typically done on callus cells (tissue culture) but is occasionally done to other plant parts, such as germline cells or pollen. Tissue culture is clusters of undifferentiated plant cells called 'callus', which are grown in culture. This allows them to be manipulated and then induced to develop into whole plants containing a copy of the transgene in every cell. There are many methods used to deliver extra DNA into the nucleus of plant cells. This method works by shooting DNA into the plant cells. Microscopic gold or tungsten particles are coated with hundreds of copies of the gene(s) to be introduced. Tissue culture cells are placed in a vacuum chamber and the metal particles are propelled with a high-pressure gas that is released in a sudden burst much like a popped balloon or air gun. 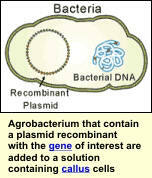 Agrobacteria is a soil bacteria that works as a natural genetic engineer. In nature it forces plants to become good hosts by inserting genes into plant cells that cause the plant to make metabolites they need for growth. Genetic engineers have taken advantage of Agrobacteria's natural abilities by tricking them to insert an altered piece of DNA that contains the desired transgene into cells. The Whiskers method uses microscopic "wiskers" that look like tiny needles with sharp ends. Tissue culture cells, hundreds of copies of the desired gene(s), and whiskers are suspended in a tube of solution and shaken vigorously. The tiny whiskers stab the plant cells potentially delivering the desired gene into the nucleus of the cell without killing it. For expanded information on Whiskers technology click here. Electroporation uses a quick pulse of electricity to open tiny pores in the walls of plant cells. If DNA is mixed in a solution with the cells, the DNA molecules are small enough to pass into the cell through these holes. The goal of any transformation technique is to transport the new gene into the nucleus of a cell without destroying it. After that, the genetic engineer has no control as to how or even if the gene will insert into a chromosome. The successful genetic engineer plays the numbers game. Because they cannot control all of the steps, they repeat the process hundreds of times in order to produce one genetically engineered plant. Genetic engineers must be able to select cells that have received the transgene from those that have not. Selecting out transgenic cells is done by co-transforming the cells with the transgene plus an additional gene called a selectable marker gene. Selectable marker genes are genes that encode easily detectable traits making transgenic cells easy to select out from non-transgenic cells. The two most commonly used selectable marker genes encode the traits of herbicide and antibiotic resistance. Of the few cells that are actually transformed during the transformation process, very few will have all the characteristics necessary to become a marketable event. An 'event' is the insertion of a particular transgene into a specific location on a chromosome. The term "event" is often used to differentiate genetically engineered crop varieties. Desirable events are rare. Most events are discarded because the transgene inserted into an existing gene important for plant growth causing the existing gene to be disrupted and not express, or the transgene inserted into a portion of the chromosome that does not allow for expression of the transgene or expression that is too low. Those events that are successful are grown to mature plants. The seed is harvested and passed on to a plant breeder who performs the last step of the process. Want to learn more about tissue cultures? Want to learn more about transformation methods?